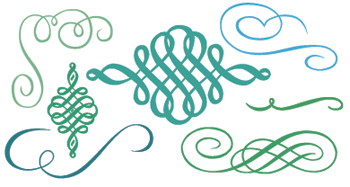 To make your own designs with calligraphic flourishes like the recipe cards in the last post, try downloading Nymphette, a free ornamental font available for personal and commercial use from Lauren Thompson. You find the greatest stuff. Thanks for sharing! thank. you. so much. i'd been looking for something free like this! it's like someone read my diary - I need and love these! thanks for sharing!! this is another reason, reason #45,694 that you are terrific! I have had this font for a while and LOVE it! oooh i have a use for these! trying to redo the packaging for my etsy store! Ooh, great find. Thanks for sharing! Thank you for this ! I am always looking for flourish details and this is perfect ! Do you use photoshop to change their color ? Since it's a font, you can just change the color like you would any other font in your word processing program, Illustrator, Photoshop, etc. Your blog is one of my favourites, thank you for sharing your fantastic finds and ideas! I also love this one especially! I TOTALLY forgot I had this font until I found this post. Thanks so much! Awesome. I just wanted to add a few flourishes to a family birthday invite, but every search came up with nothing but paid stock photos and expensive vectors. This hits the spot; thanks!